Please be aware of the address change. Updated article will be published soon describing the new location! Canandaigua, New York sits near the western most end of the Finger Lakes. It is a bustling little community and serves as a gateway to the Finger Lakes wine region, playing host to the New York Wine and Culinary Center. 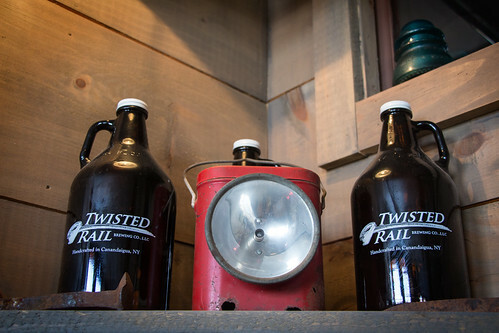 One of the area’s newest breweries, Twisted Rail Brewing Company, recently opened and it made for a perfect ending to our day of visiting sites to write about for Liquid Alchemy. 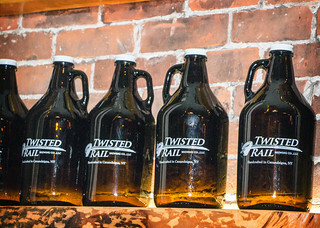 Twisted Rail Brewing Company was established in December 2013 by John McMullen, his brother Mike, and their friend Nathan Sirvent. John had been homebrewing for many years prior and was ready to introduce his beer to the public at large. 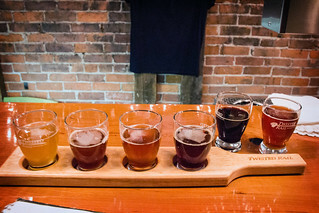 Twisted Rail has a Farm Brewer’s License which allows them to sell not just sample flights, but pints as well. The evening of our visit, we were helped by Susan, who was able to tell us a lot about the brewery. But first, a look at what we tried on our visit. Made with orange peel, coriander, and a Saison yeast. An excellent example of this style, Saison yeast adds a nice spiciness. A traditional Scotch Ale; sweet, with a nice malt backbone. Very fresh, well-made Extra Special Bitter. Brewed with nutmeg, cinnamon, coriander, and orange peel. Very heavy on the spices with lots of nutmeg, but the coriander manages to tone it back a bit. Brewed with smoked malted barley. Smoky, but not overly charred. Pretty interesting. Big, big tropical notes and flavors. Almost like a double IPA. Considering the fact that Twisted Rail has only been open since December, they are doing very well. The beer I tried was decent, and I was impressed by the Farmhouse Ale. The brewery is located in a renovated railroad depot and this history is evident in the design choices. Original brick walls, an old wooden floor, and multiple railroad signs help create the perfect atmosphere, even if the location seems a bit small. The beautiful wood counter at the bar is made from Cherry that was harvested in nearby Naples, NY. There is a subtle touch you might miss while sitting at the bar; your feet are resting on an old section of rail. 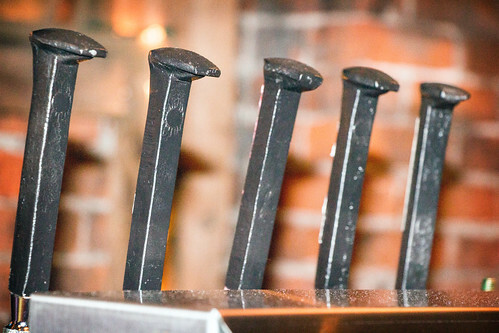 Even the tap handles are made from recycled railroad spikes! 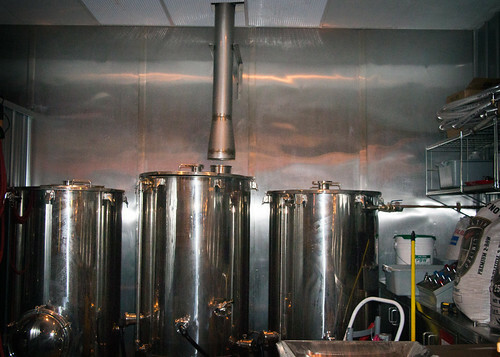 Because of the size of the location, the brewery equipment takes up one end of the room. John brews on a 3 barrel system and I imagine that he has to invade the bar area to do his work when the customers are not there. He is a big fan of well made IPAs, and strives to make the perfect IPA. Unfortunately, he is still searching for the best Simcoe hops as those he has right now are missing certain characteristics he is looking for. 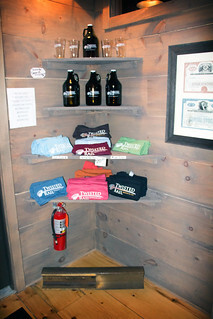 While at the brewery you can also buy t-shirts and growlers. If you are not interested in beer, glasses of wine from local winery, Dr. Konstantin Frank Winery on Keuka Lake, can be purchased. Growler fills are available for just twelve dollars and they will fill any growler that you bring them. The most popular beer currently produced is the Farmhouse Ale and I definitely concur with that. Lots of area bars are interested in offering their beer to customers, but Twisted Rail is taking it slow to make sure they have adequate supply and resources to continue to produce a quality product. In February they also released a double chocolate porter which I would have loved to have tried but I never made it back to the brewery in time. I think that Twisted Rail Brewing Company is off to a great start. The beer that they had to offer when I was there was pretty good considering they had been open for less then a month. As one customer said to me during my visit, the beer is “delicious and delightful!” I will be sure to stop back the next time I am in Canandaigua. During a recent trip to Canandaigua, we had the opportunity to revisit Twisted Rail to see what was new and interesting. We had a pleasant conversation with “Twisted” Suzie while trying out their latest lineup of beer. Super malty, not overly bitter; notes of sweet butterscotch. Currently their most popular beer. Nice roasty, bitter nose. Coffee, dark espresso, burnt toast, and chocolate all intermingle on the palate. Smooth and very easy drinking. Tropical, hop forward, medium bodied beer. Really flavorful Belgian notes; it is a great hybrid of a farmhouse Saison and a Pale Ale. Light floral notes, a bit sweet and tropical. A refreshing hoppy finish. I was delighted to see the diversity of new beers available at Twisted Rail when we were there. They also had the Farmhouse Saison which we really enjoyed during our initial visit. We made sure to purchase a growler to take home with us. One of the things Susan mentioned was that they are starting to label their beers with train themed names. This will help them to differentiate themselves and make the beer easier to find on beer tracking applications such as Untappd. Other projects in the works for Twisted Rail include a blonde, a scotch, and an all New York State hops and malt beer. The NY only ingredient beer will be quite interesting to try and is a good choice for a farm brewery such as themselves. On the walls of the brewery you can now find art for sale. A rotating art show, “LocalMotive” displays paintings, photos, and more from various local Finger Lakes artists. This is a great way to give people something new to see every time they stop by and also support the local arts movement. Distribution has increased a bit but mostly they are just concentrating on building up stock to be sold at current locations. The tasting fee has gone up slightly, to $6.00; still a great value for your money. The selection of local Finger Lakes wines has also expanded to include other familiar favorites such as Heron Hill and Inspire Moore. I am excited to see that Twisted Rail continues to improve and create excellent beers. If they ever decide to move to a larger brewing facility, it would be great to have their products get increased distribution. Until that time comes, I highly recommend spending an afternoon with “Twisted” Suzie and the crew while having a flavorful pint of Ale! Looking for a delicious meal after visiting the brewery? 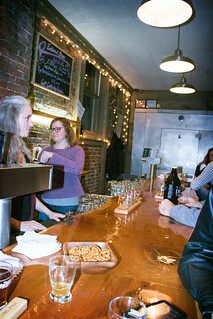 The other half of the old railroad depot hosts The Bee Hive Brew Pub. The Bee Hive serves up plenty of pizzas, burgers, sandwiches, and more. 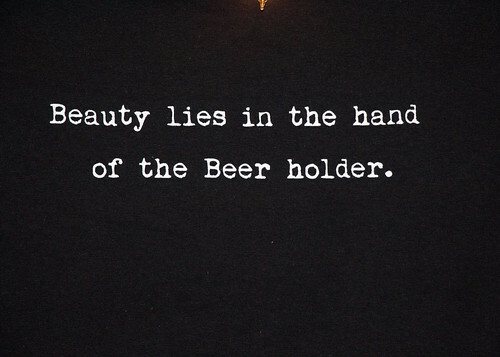 They also have an extensive beer menu which focuses on craft beer. The Bee Hive even has house beers that are made for them by CB Craft Brewers. Be sure to check them out for an excellent meal after trying the beer at Twisted Rail! Thanks for the shout out! See you again soon!